There are martial arts movies. And then there are Martial Arts Movies. But there is only one GYMKATA. There are those who will proclaim that GYMKATA is one of the worst movies ever made. Do not heed their blasphemous words. There is only one GYMKATA. And you will be the poorer if you do not watch it at least once. 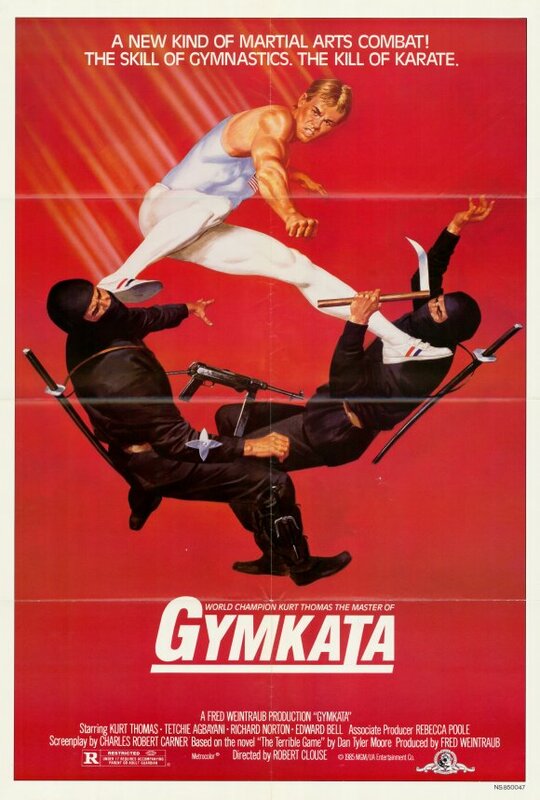 All hail GYMKATA because there has never been a martial arts movie like it and we should bless The Gods of Celluloid that once upon a time Hollywood made movies like GYMKATA. You still doubt me, O unbeliever? Back in June of 2006 Warner Brothers and Amazon.com conducted an Internet poll asking which movie not available on DVD did people most want to see on DVD. The undisputed winner by a landslide of votes? GYMKATA. Ask fans of martial arts movies for a list of their favorite movies and I’d bet you next month’s rent that GYMKATA will be in the top five. Is it because GYMKATA is such a fantastically well-made movie? Well, actually no. It doesn’t sport a big budget or recognizable name actors. In fact, the star of this movie, American Olympic gymnast Kurt Thomas never made another movie in his life. So what is it about GYMKATA that makes it such a cult hit? The totally goofy premise of the movie is what sells it to me. As well as the tight, professional direction of Robert Clouse who directed “Golden Needles” “The Big Brawl” “Black Belt Jones” and the “Citizen Kane” of martial arts movies: “Enter The Dragon.” And it’s just plain flat out fun to watch. GYMKATA is one of those movies that I’ve seen maybe a dozen times but every time it comes on TV, damned if I don’t stop what I’m doing to watch. Jonathan Cabot (Kurt Thomas) is recruited by Mr. Paley (Edward Bell) of The Special Intelligence Agency to play The Game. It’s a survival race held in the small but strategically important country of Parmistan. The Game is a hideously dangerous obstacle course complicated by the players being hunted by Parmistan warriors. Whoever wins The Game is granted their life and may make one request which must be granted by The King. The SIA needs Jonathan to win The Game so that he can request The King to allow the United States to install a satellite monitoring station, part of The U.S.’s “Star Wars” Strategic Defense Initiative. 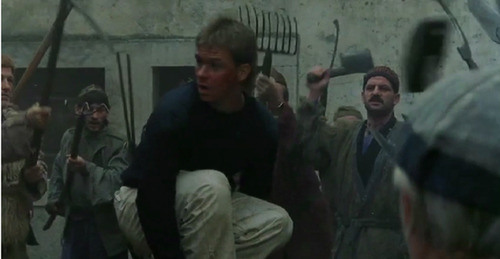 Jonathan’s father, Colonel Cabot (Eric Lawson) played The Game and presumably lost as he never returned to the United States. Jonathan is trained by two martial arts masters (one of them the dependable Conan Lee) to play The Game. He’s also assisted by Princess Rubali of Parmistan (Tetchie Agbayani) who’s going to give Jonathan an edge by telling him ahead of time the various obstacles he’ll encounter as they change every time The Game is played. Princess Rubali wants Jonathan to win as she doesn’t trust her father’s chief advisor Zamir (Richard Norton.) Zamir not only wants Rubali for himself, he wants to sell out to “the other side” and let them put up their own SDI system. With the help of his trainers, Jonathan develops “gymkata” a fighting style combining his gymnastics with karate. Can Jonathan win The Game and survive the vicious attempts on his life orchestrated by Zamir? What, are you kidding me? 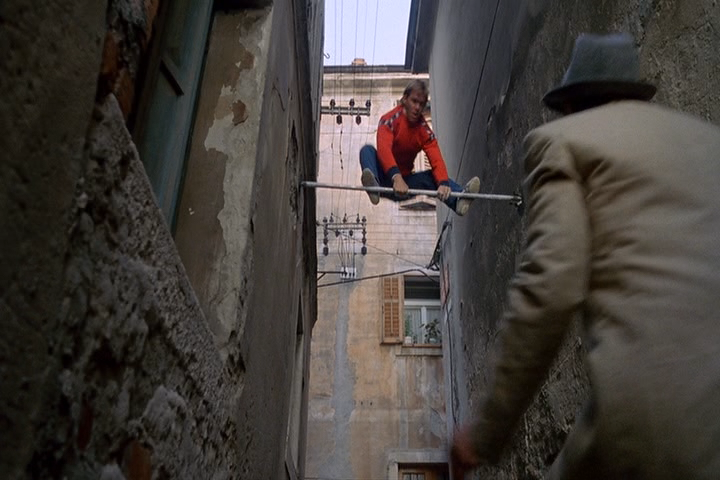 Now here’s the reason why GYMKATA is such a hoot to watch…there’s a couple of major fight scenes where gymnastic equipment conveniently shows up to enable Our Hero to show off his acrobatic ability. In one fight, Jonathan is being chased by some Bad Guys and just happens to find a bar strategically suspended between two walls that he’s able to use to swing and twirl while he fights. And then there’s the classic battle in the Village of The Damned (It’s where Parmistan dumps all of its insane.) Jonathan is being chased by a hoard of homicidal lunatics, makes a turn onto the village square and lo…there’s a pommel horse! What happens next just has to be seen to be believed. And actually, that entire sequence in the village of crazies is pretty spooky and suspenseful with some really creepy images. Kurt Thomas actually isn’t that bad an actor. He’s no Robert DeNiro but then again, he’s not trying to be. It’s too bad there wasn’t an “Iron Fist” movie made in the 1980’s as Kurt Thomas would have been absolutely perfect to play Danny Rand/Iron Fist. His acrobatic ability is astounding and it sure looks to me like he’s doing a lot of his stunts. I also enjoy the spectacularly beautiful Tectchie Agbayani as Princess Rubali. At first, Jonathan thinks she can’t talk because she never says anything to him. As he finds out later on, she can talk. She only does so when she has something important to say. If only more women could be like Princess Rubali. Bottom line: GYMKATA is massive fun to watch. It’s a great Saturday night movie, especially paired with some of the other martial arts movies I’ve named. GYMKATA is goofy, silly and a cult classic that has come by its reputation honestly. ‘Awesome’ is a word that has become overused in describing everything from a ham sandwich (really, folks? Is any sandwich really ‘awesome?’) to hairstyles. But GYMKATA deserves to be called awesome. The complete movie is available on YouTube and I’ve provided you guys a link below. Watch and enjoy.